Mangas Coloradas, aka: Dasoda-hae (Red Sleeves) (1793?-1863) – Born in New Mexico, Mangas Coloradas was a superb Apache warrior who eventually became the chief and war leader of the Eastern Chiricahua Apache. In the 1820’s and 1830’s, the Apache’s chief enemy were the Mexicans, who had gained their independence from Spain in 1821. As War Leader, Mangas Coloradas led a number of attacks on Mexican settlements in Sonora and Chihuahua. When the United States defeated Mexico, to acquire the lands of New Mexico and Arizona, Mangas Coloradas signed a peace treaty, respecting them as conquerors of the hated Mexican enemies. However, the peace was tenuous and conflict began as numerous white settlers encroached upon Apache lands and Mangas was personally attacked by a group of miners who tied him to a tree and severely beat him near Pinos Altos, New Mexico in 1851. Continued violations of the treaty soon led to Apache reprisals. 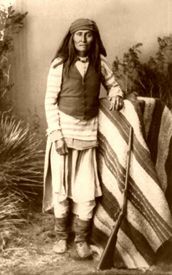 In 1861, his son-in-law, Cochise, was falsely accused of kidnapping a young white boy and arrested along with several other Apache. Cochise was able to escape, but the event led to all out war against the white settlers. Mangas Coloradas soon joined with Cochise, as well as Geronimo in staving off the white settlers. In January, 1863, General Joseph Rodman West, under orders from General Carleton, was able to capture Mangas Coloradas by meeting with him under a flag of truce. Though allegedly a peaceful conference, the U.S. Army took Mangas Coloradas prisoner and later executed him on January 18, 1863. This, of course, very much angered Cochise and Chief Victorio, who retaliated even more against white encroachment, a state which continued for the next nine years.